[narrating] Every surgeon has a shadow. And the only way to get rid of a shadow,is to turn off the light. To stop running from the darkness, and face what you fear. Head on. Meredith: I know there's a ring. Meredith: The Chief told me. I know there's a ring. Meredith: Is that the best you've got? 'Cause I'm not bailing, we're in this together. Derek: Just go home Meredith. Meredith: You don't get to just stand here and tell me. Derek: This is what you want, I'm giving you an out. Go. Meredith: I'm not going anywhere. Derek: I SAID LEAVE! MEREDITH, LEAVE! Meredith: Oh, Ok. So you're just quitting? Derek: You should understand better than anybody else. You wrote the book on quitting. Running, hiding, you've written a lot of books Meredith. Meredith: That may be true. But I'm here now. Derek: Oh, hmm, you're here now? Haha. You've wanted me out since the day I moved in. Meredith: That is not true. Derek: Because you're incapable of anything that resembles commitment. You lied to me, you said you were healthy. That you were healed. There's no fixing you, you're a lemon. Meredith: You cleaned all of your clothes out of the closet at the house. Derek: Go home Mer. Just go home. Meredith: Well, how long are you planning on hiding out here? Because that's what you're doing. You're hiding. You made a mistake, she's dead and you can't hide from that. Derek: I'm not hiding. I'm done. I'm done operating. Mark: You think you broke me little Grey? You're the one that put me back together. Richard: I know I have no business asking you for anything, but I need your help. I need you to bring Derek back. And he's not fine. Meredith: Sometimes people just wanna be left alone. Richard: He's planning to propose. He's been carrying around a big ring for weeks. That's not a man who wants to be left alone. I just thought you should know. Owen: What are you doing? Cristina: Assigning myself to a trauma with you tomorrow. Cristina: You know, I'm a big girl. I can handle my share of trauma, and I get to decide when I've had enough. It's gonna take a lot more than a bad dream to scare me off. Owen: It's more than a bad dream. 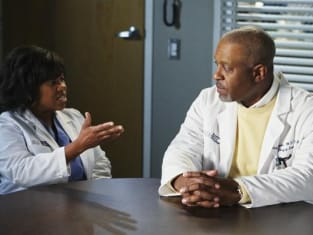 Alex: I know you like teaching and that's great, but you need to start treating real patients, with real surgeries. Because once they see you as weak, it's over. And Izz, you can be a great surgeon. We could be great together. You just, you gotta stop screwing around. Because I don't wanna be the future of this hospital if you're not there with me. Okay? Alex: Iz! they said I could do the distal anastomosis on my own. Alex: That's crazy. They just told me I could be the future of this hospital. That I'm the resident to watch. And that's... I mean... I'm not the kinda guy who. I don't rise okay, I sink to the bottom. And now I'm getting all this, all this respect. And you... you gotta, you gotta stop wasting all your time with this patient X crap. Lexie: I learned a lot today. Diagnosing a patient from beginning to end. So, thank you for teaching us. Izzie: What would you say? To patient X. How would you... How would you break the news? Lexie: Screw the odds! People die of the hiccups. My mother died of the hiccups. Survival rate for that is what... 100 percent? The odds are that she should be alive right now. The odds are... The odds are crap! So people should face it and they should fight. Maybe not those words. Izzie: No. Exactly those words. Thank you doctor Grey. Intern: After the last contest, we got a prize. Intern: Yeah, what's our prize? Izzie: You think every time you diagnose a patient and hand someone a death sentence, there's a prize? The prize is, you didn't screw it up this time. The prize is, you people actually did something right. The prize is, you were doctors today. You were doctors. That is the prize!